Fresh & Soothing Sensitive Skin Shampoo is made with natural ingredients you can trust! 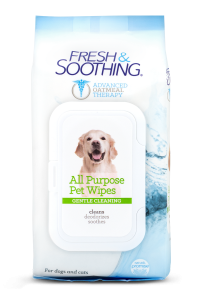 Our unique formula gently cleans and nourishes the most sensitive skin and is perfect for pets with allergies. Fresh & Soothing Sensitive Skin Shampoo is infused with aloe and oatmeal for a gentle, soothing clean. 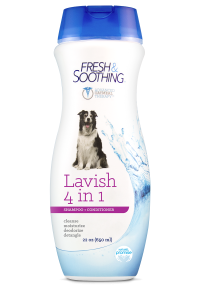 The rich, soothing lather with a dash of cocoa butter fragrance creates a relaxing wash ready for snuggles. 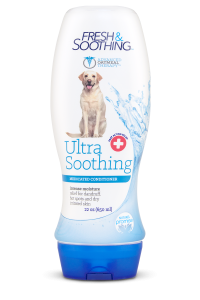 Fresh Soothing Sensitive Skin Shampoo is tearless, soap-free and paraben-free, (will not impact spot-on flea products). Wet coat and apply a generous amount of shampoo, to obtain a rich lather. Massage well into coat. Rinse. Dry. Perfect for routine use.